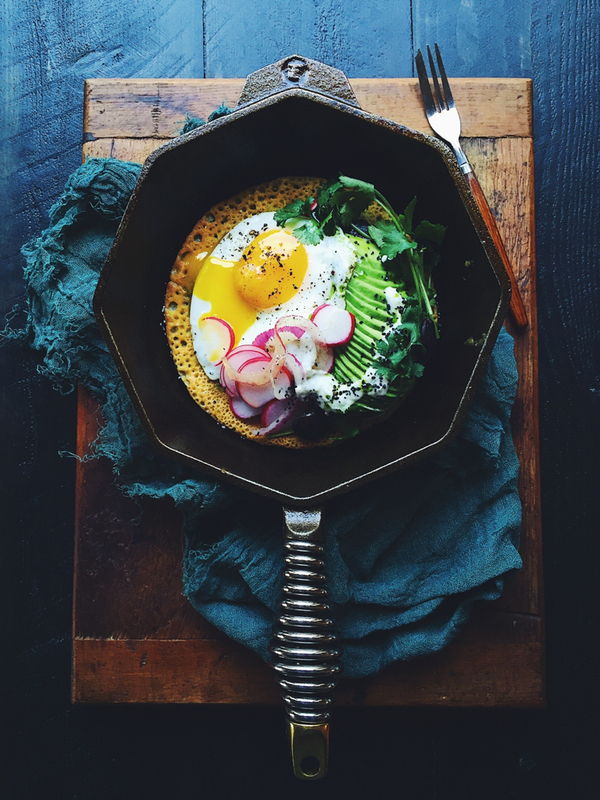 Mexican-style Cast Iron Socca & Eggs | FINEX Cast Iron Cookware Co. Contributed by Jessica Fiorillo who is the founder of Propped (www.propped.com), a curated online marketplace for kitchenware and tools. I remember my first cast iron pan. I was on a mission to learn how to cook and as such, my regular weekend routine included watching a non-stop train of TV cooking shows and internet videos. My kitchen repertoire was pretty basic at the time – a few stainless steel pots and pans that my parents had suggested that I buy post-college when I’d moved into my first apartment. I didn’t have much cabinet space so I wasn’t inclined to fill out my kitchen with more gear. But a number of TV chefs were using cast iron to cook and I was intrigued by this kitchen multitasker – a pan that could seamlessly move from cooking non-stick foods like eggs and fish to braised dishes requiring a high sear and even desserts (I’m talking about you crumbles and skillet cookies). They seemed complicated though – there was talk about seasoning the surface, baking with oil when first unpackaged. And to a novice cook, it seemed like too many questions – had I seasoned it right? Did I ruin my pan if I’d done it wrong? So I passed on cast iron, moving from one apartment to the next, gradually building my skills and competencies as a cook. I got myself a cast iron pan eventually, taking the plunge with a bathtub of a pan, better suited for cooking cowboy beans for 20 than a date-night-in for two. But once I started to use it, I fell in love. Cast iron became my go-to method for cooking. I loved its versatility, its weight, and the seasoning that built up over time as I cooked from my latest finds from the San Francisco ferry building: heritage pork, freshly-caught shellfish and seasonal vegetables. I realized quickly that seasoning wasn’t something to be scared of; rather, it accumulates without notice, increasing the non-stick nature of the pan. Each dish lending yet another page of rich history. Fast forward ten years, my cast iron obsession still unchecked, I stumbled upon a thing of beauty while flipping through my Instagram account. It was cast iron, but like nothing I’d ever seen before. The shape was distinctive – an octagon – so different from the round pans that I’d seen on store shelves. And the handle – a spring coil to keep it cool during stovetop cooking – made it look more like an art piece than something that I’d want to hide away in my kitchen cupboards. There’s nothing that quite prepares you for the moment you pull your first Finex cast iron skillet out of the box. You know that it’s going to be beautiful, but the craftsmanship catches you off guard. The weight, the distinctive lack of greasy seasoning oil that covers so many other cast iron products, the shiny newness of it all. There’s a reason that Finex is my go-to gift for holidays and birthdays. I want others to experience that same feeling as they unbox what will surely become their favored kitchen tool. The perfect tool for quick weeknight dinners, or lazy Sunday breakfasts, as showcased by the Mexican eggs & socca recipe below. 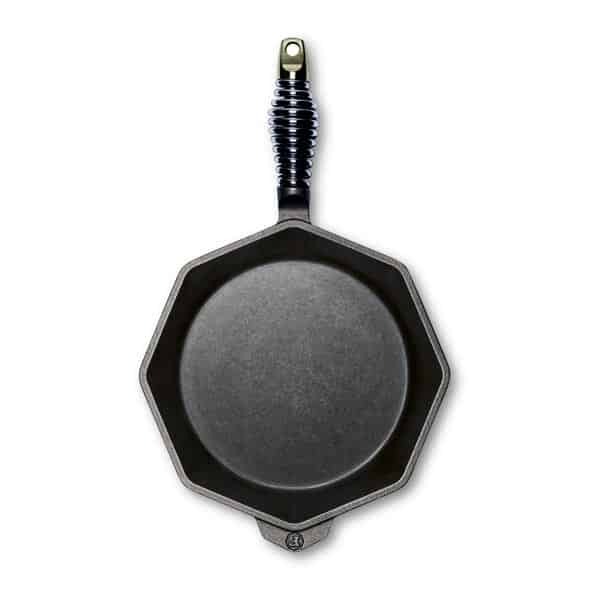 A pan as perfect for novice cooks as it is for kitchen experts. So fire up the oven, the stove, and even the grill – wherever you’ve got heat, you’ve got your Finex to make your kitchen efforts come to life in the most beautiful way. Happy cooking everyone. The directions may be long but cooking this dish goes quickly. Just prep a few different pieces of the recipe, and with a minute of quick assembly, you’re done! Make the pickled onions by tossing the onions with the sugar, salt and white wine vinegar in a bowl. Let the onions sit and mellow while you prep the other parts of the recipe. Make the lime crema by mixing the yogurt with the lime juice and grated zest. Set aside. Make the cumin black beans by heating the olive oil in a Finex saucepan, then adding the garlic until it sizzles but doesn’t color. At that point, add the cumin and cook for another minute before adding the black beans + salt and cooking together until beginning to soften, about 5 mins. If the bottom is starting to stick, add a little water and stir. Set aside. Last, make the socca by whisking the chickpea flour + water and 1.5 tablespoons of olive oil (reserving some for the pan) + the salt. Let the batter rest for at least 30 minutes. When the batter has rested, ladle half the mixture into a preheated 10-inch Finex cast iron skillet (medium heat is best). Swirl the pan gently to make sure the socca coats the whole pan. Like pancakes, when you see bubbles, gently flip the socca and cook another minute before transferring to a plate. Finish cooking the second socca.